ABT Sportline has given the Euro-only RS3 a big-time power upgrade. ABT Sportline is known for their work on several Audis of note, including A7, R8 GTS and A6. The tuners from Kempten are back, this time with a more powerful and aerodynamic aftermarket program for the Audi RS3. 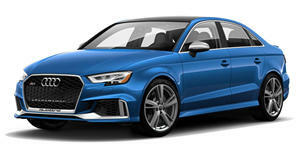 The German tuners have fitted their in-house turbocharger to the RS3&apos;s 2.5-liter TFSI engine and remapped the ECU for a total power output of 470hp and 465lb-ft of torque. In comparison, the RS3 at stock features a power output of 335hp and 332lb-ft of torque. It can jump from 0-62mph in a slight 4 seconds, great time for a hatch. The car can hit a top speed of 177mph sitting on its 19-inch light-alloy wheels. The wheels are offered in three designs. No pricing information has been released yet.